The Great Limpopo Peace Park began with a meeting between President Joaquim Chissano of Mozambique and the president of the World Wide Fund For Nature (South Africa) in 1990. Feasibility studies initiated by the World Bank culminated in a pilot project that was launched with Global Environment Facility funding in 1996. On 10 November 2000, a trilateral agreement was signed by Minister Helder Muteia (Minister of Agriculture and Rural Development in Mozambique), Minister Valli Moosa (Minister of Environmental Affairs and Tourism in South Africa), and Minister Francesco Nhema (Minister of Environment and Tourism in Zimbabwe). This agreement signalled the three nations intent to establish and develop a transfrontier park and surrounding conservation area. 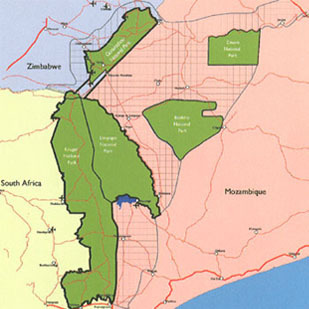 On 9 December 2002, the heads of state of Mozambique, South Africa and Zimbabwe signed an international treaty at Xai-Xai, Mozambique to establish the Great Limpopo Peace Park. Where is Great Limpopo Peace Park? The Great Limpopo Peace Park links the Limpopo National Park in Mozambique, Kruger Natioinal Park in South Africa, Gonarezhou National Park, Manjinji Pan Sanctuary and Malipati Safari Area in Zimbabwe, as well as two areas between Kruger and Gonarezhou, namely the Wngwe communal land in Zimbabwe and the Jumbo region in South Africa. The total surface area of this Peace Park will be approximately 35.000 km2. 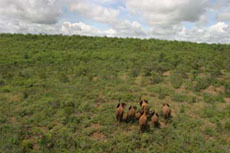 The four main landscapes in the Great Limpopo Peace Park include lowland plains savannah in the majority of the area, a somewhat hilly granite plateau in the western portions, the Lebombo mountains that rise to an average of only 500 m above sea level, and the floodplain riverbank areas along the Save, Changane, Limpopo, Olifants and Komati rivers. The vast numbers of wildlife and plant species found here are the building blocks of successful eco-tourism. These include at least 147 mammals, 116 reptiles, 49 species of fish, 34 different species of frogs, and an incredible 500 or more species of birds. In addition, at least 2000 species of plants have been identified. Stone-age artifacts and more recent Iron-age tools at many sites provide evidence of a very long and almost continuous presence of humans in the area making up the Great Limpopo Peace Parks. Early inhabitants were San hunter-gatherers who left numerous rock-paintings scattered across the region, while Bantu people entered about 800 years ago, eventually displacing the San. The arid nature of the environment, together with an abundance of predators and diseases (e.g. malaria) would have played a role in preventing large-scale human population growth and settlement. Nevertheless, sophisticated cultures already existed by the 16th century, evident by the Thulamela and other ruins near Parufi.